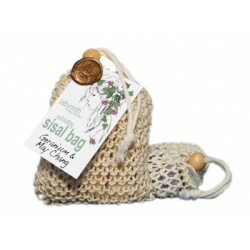 Natural fibre Sisal Bags filled with cubes of handmade soap to moisturise and gently exfoliate your skin while you wash. Ideal for use either in the shower or your bath. The wonderfully cooling blends of floral Geranium and refreshing May Chang are attributed to providing a tonic for the nervous system, aiding relief from tension headaches and calming restlessness and anxiety. Their antiseptic, anti-inflamatory, healing and deodorizing qualities are believed to assist the treatment of acne, eczma and psoriasis. The balancing properties of Geranium oil make it suitable for both dry and oily skin. Olive Oil (Sodium olivate), Coconut Oil (Sodium cocoate), Regulated Palm Oil (Elaeis guineensis), Spring Water (Aqua), May Chang (Litsea cubeba), Geranium (Pelargonium graveolens), White Clay (Kaolin). Naturally Occuring: Geraniol, Linalool, Limonene. Labyrinth handmade soaps contain only pure, natural products. No artificial chemicals, preservatives, animal fats or animal derivatives whatsoever. Labyrinth use finest quality butters and oils to produce a soap that not only cleans but leaves your skin feeling refreshed, moisturised and invigorated. Their palm oil is sustainably sourced.